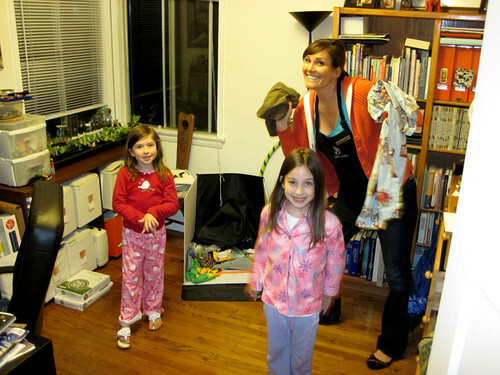 I recently had the great honor of hosting an over-night camping trip with two of my nieces. 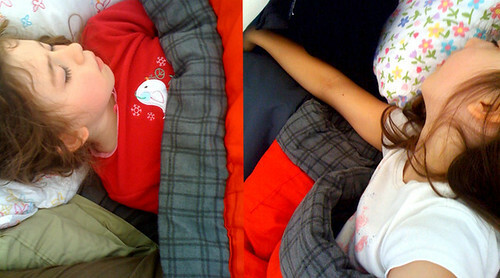 This was their first camping experience, and for the eight and six year old, I knew the concept of sleeping outdoors was exciting, and a little scary. My husband and I share a love of camping, and one day hope to take my nieces, their mom, dad, little brother, and baby sister out camping on the sandy beaches at Morro Bay. 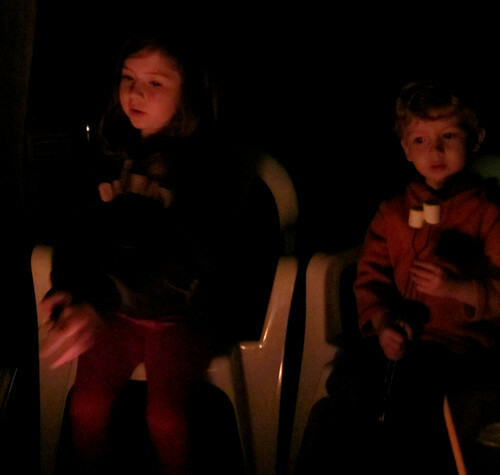 Or perhaps we’ll all cozy up around a fire ring at Mt. Pinos, surrounded by pine trees, lichen and mostly melted snow patches. For their very first camping trip however, we stayed a little closer to home. In fact, we were home. 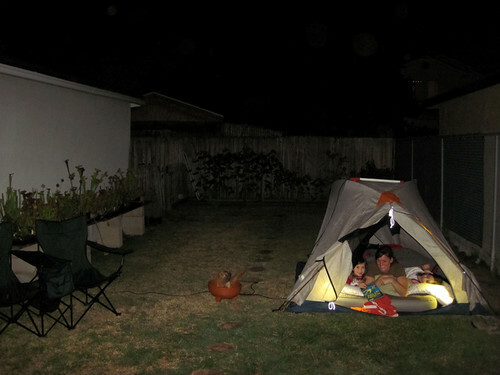 Camping on the lawn, not twenty feet from the house. Just in case. The guest-list for the celebration dinner that night included the aforementioned parents and kids, a set of grandparents, and a friend from work. 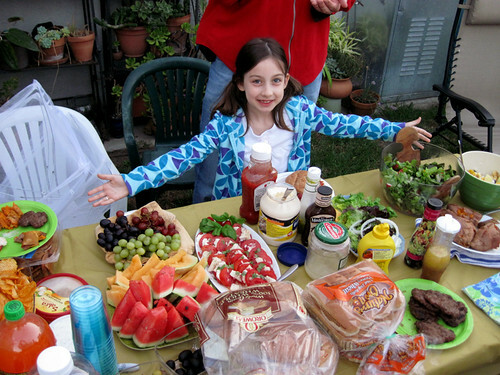 BBQ fare was hamburgers, melon, Caprese salad, green salad, fruit salad, and of course, S’Mores (marshmallow salad?). 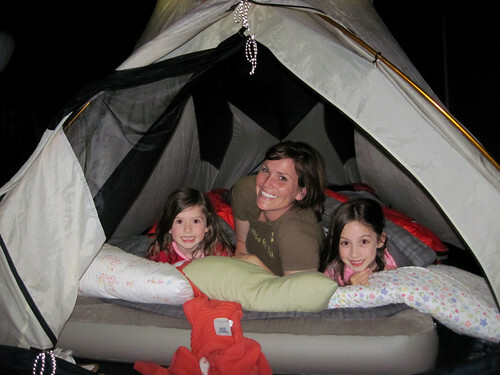 No ghost stories were told this night, as I would be the sole adult in the tent with the girls. The Mister enjoyed a restful night’s sleep in our bedroom and I made him promise that he wouldn’t sneak outside during the night to scare us. This was “practice camping”. Not “scare-the-bejesus-out-of-these–young-girls-so-that-they-never-want-to-go-camping” camping. After saying goodbye to their parents, washing off the marshmallow stickiness, and brushing our pearly whites, we donned our jammies, kissed the Mister goodnight, and read a few books. The girls fell asleep almost immediately, and woke up happy and refreshed. It was really a joy to share a tent with such happy campers. We completed the experience by preparing and eating breakfast outside. I cheated and made toast in the kitchen. 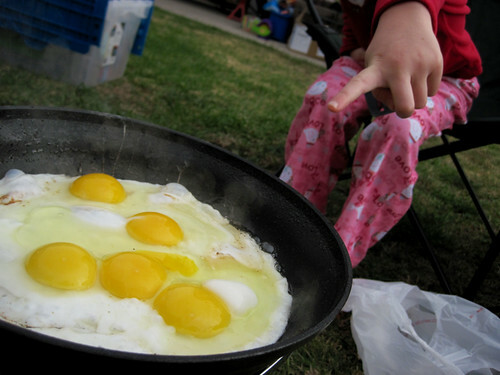 The girls were tickled that we were makin’ bacon on a one-burner propane cooker and single frying pan. 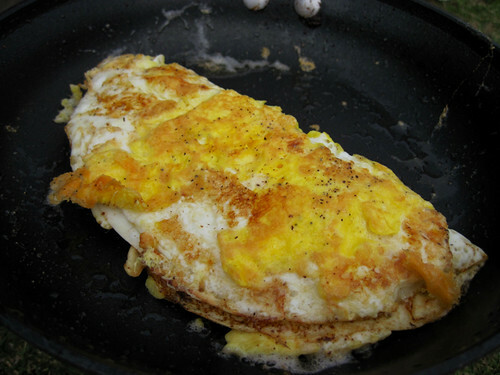 The Mister also made us an incredibly tasty omelet with fried cheesy bits. It was a success all around. Labor day is approaching, and while campsites may be filling up all fast, your own backyard is most likely still accepting reservations.